In my case I am running Ubuntu 10.4 LTS – 64 bits workstation operating system on a desktop computer. Android’s SDK is Java based so the first think is to make sure Java JDK is all set up. 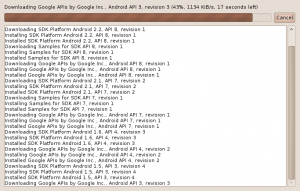 Yeah, Android folks have a specific “Ubuntu Linux Notes” section, it is not great. Seems like I need to make sure I got “ia32-libs” and “sun-java6-jdk” packages installed. Lucky me! I got all that stuff installed already, go figure that would be the case for a software geek, well I am not embarrassed in any way. Ok. Seems like Eclipse IDE for Java developers “Galileo” version is a recommended one, this one I know I do not have installed while I do really prefer the Bash shell and a trusty plain text editor like “Emacs” or “Vim” but I do not think it will hurt having this tool as part of the arsenal just in case is really needed one day. I am not going to explain the whole Eclipse installation which involves downloading a “tar” file, unpacking its content and create a application launcher. Instead I will make a reference to John Paulett instructions which I followed to have this task completed. Well, seems like that is it to get ready so let’s get into the subject matter now. Good, this part is also pretty straight forward. 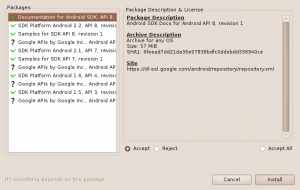 It requires to download Android SDK core files, unpack them under your home directory and add a reference to system path to make programs within tools folder available. 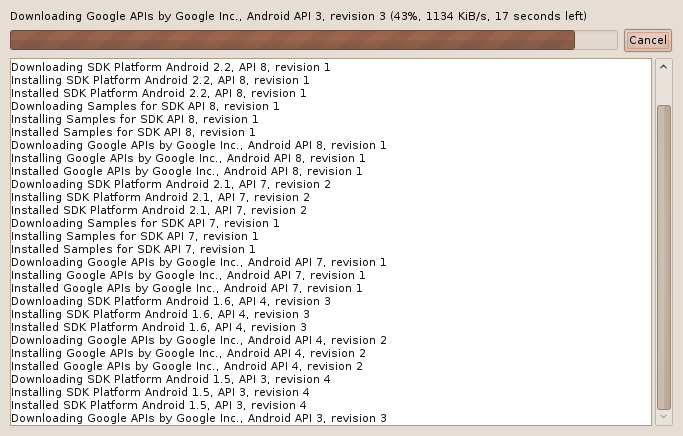 So far everything has been business as usual with no problems following Android’s page instructions, nice!! The content of the core SDK folder is shown in screen-shoot below. 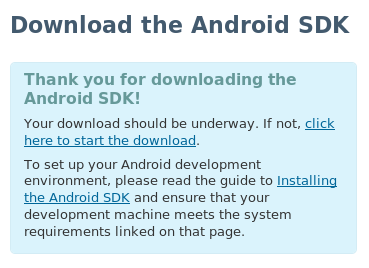 Well, Android SDK installation instructions dedicate a section to help you configure Eclipse’s required Android Development Tools plug-in. If you are looking for using the shell this step is not necessary. 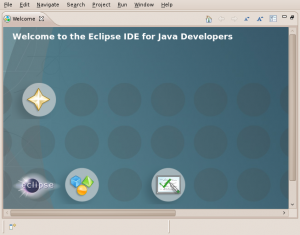 I am getting the feeling that Eclipse is a big deal for Android development or just a big deal for Java developers in general, I can not make an opinion on this topic by now but I am intrigued to learn more about it so I will go ahead and have this ADT plug-in setup. Wow, to get to the actual ADT plug-in installation instructions you have to navigate for a couple of links, here it is a shortcut to the actual “Downloading ADT Plug-in” page. Configuring this plug-in involves several steps as shown in screen-shoots sequence below. Step 2. Adding plug-in site information. Click OK. Step 3. Select developer tools to be installed and click next. Step 4. Well, if you want to continue you must agreed with terms and conditions. Nothing to be afraid here with a GNU Public License. Step 5. Well, I did not expect this message but seems like Google still need to work with the Eclipse folks to have ADT packaged signed. I would not worry about this and click OK. Step 6. Well, Eclipse needs your confirmation about accepting this unsigned certificate. Yes, no problem click OK. Step 7. What??? 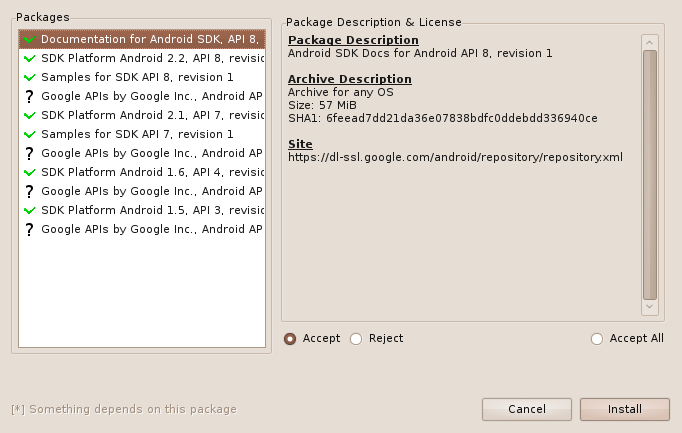 Three times to convince Eclipse IDE that I really do not care about Google’s unsigned package problem. Click OK. Step 8. Cool, after few minutes we got this ADT plug-in installed. wonder if other Eclipse plug-ins also get force to pass over all this clicking OK and Next buttons sequencing. Seems like we are good now! I guess this is the installation step we have been waiting for. 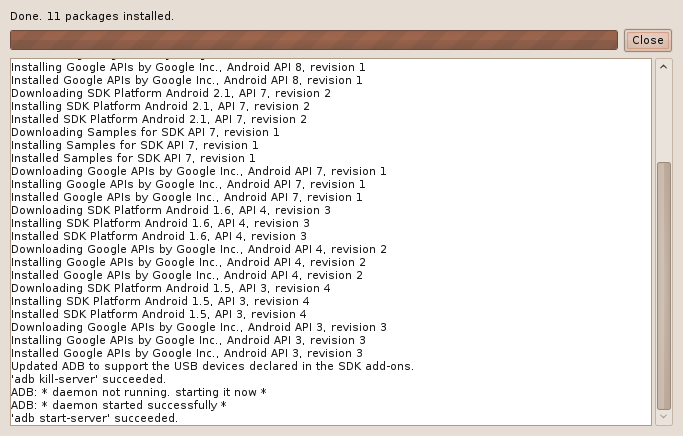 Time to install Android SDK platform and extra components. After reading the brief explanation I decided to go for the “FULL” install. One more click takes me to “Adding SDK Components” page. There are many ways to do this including a very easy and straight forward via bash but we have got our Eclipse IDE and ADT plug-in installed already then let’s try the GUI way this time. Just had to open up Eclipse IDE again and followed the steps as shown in scree-shoots sequence below. Step 1. 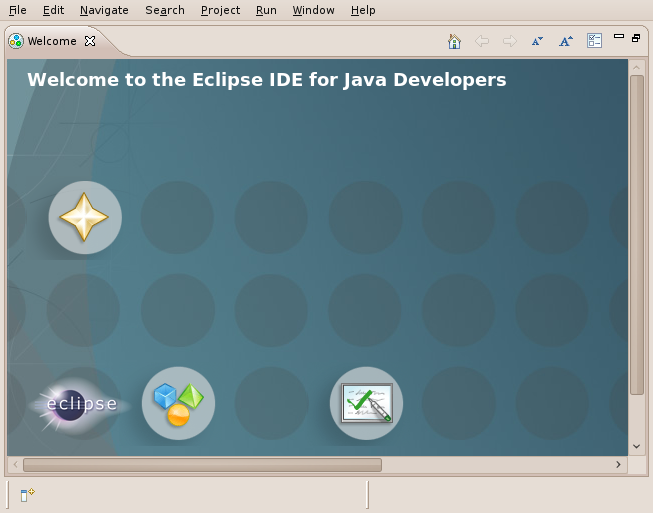 From Eclipse IDE select from Menu. 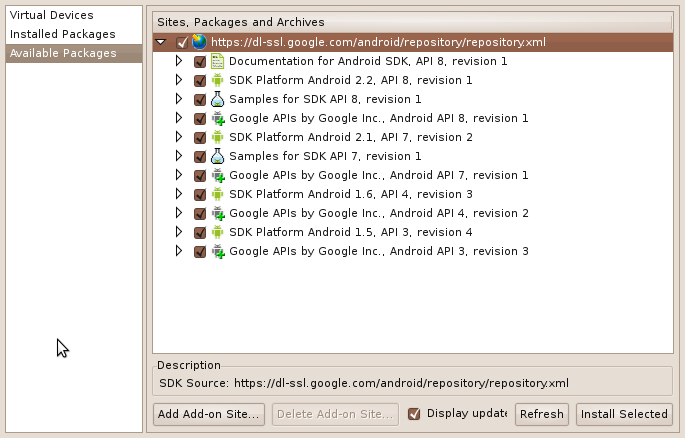 Windows -> Android SDK and AVD Manager. Step 2. I am committed and went ahead selecting all “Available Packages”. Click “Install Selected” button. Step 3. Yes, I am sure. select accept all radio button and click “Install” button below. Step 4. Things are looking promising now, just need to wait until all these components are downloaded and installed. Step 5. Cool, Eclipse installer found a dependency. Well I accept it. Clicked Yes and things continued. Step 6. Cool, it all done. Click “Close” and got back to Eclipse IDE, no errors! The installation process indeed is not complicated but it takes several steps and different applications to be executed, at least for Linux 64 bits version some basic Linux shell knowledge is definitely required. 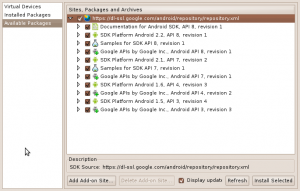 Seems like Eclipse IDE is optional but there is a lot of documentation that suggests that is a good idea to use it not only for installation but for executing common Android development tasks as well. I will be writing about “Hello World” Android application tutorial and other findings in a separate articles. 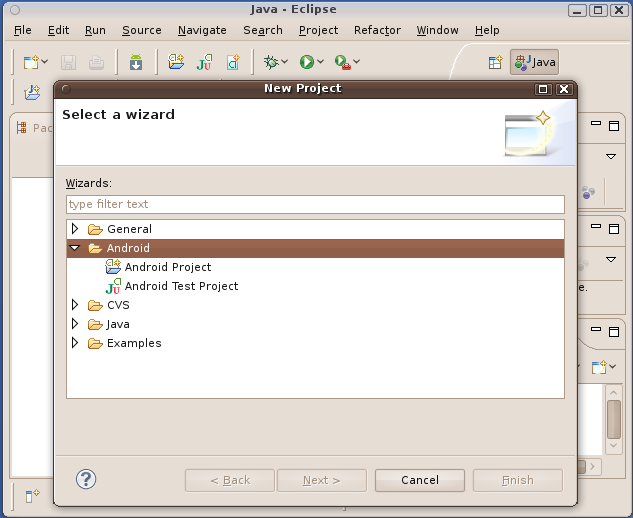 Now we are ready to create Android projects from Eclipse IDE as shown in scree-shoot below! Yeah. 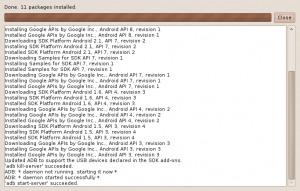 This entry was posted on Friday, June 4th, 2010 at 11:53 pm	and is filed under Android, Computer Programming, Linux stuff. You can follow any responses to this entry through the RSS 2.0 feed. Responses are currently closed, but you can trackback from your own site. Good to determine you back. And again by having an interesting article.